The Sedgebrook Apartments are situated in the inner city suburb of Springhill and offers furnished short term rental accommodation that is ideal for holiday makers, relocation people and corporate visitors while visiting or relocating to Brisbane. Combining a range of resort style accommodation, friendly service and a great Brisbane location the Sedgebrook on Leichhardt is the perfect place to stay for a business trip or holiday. This budget property also has lots of great facilities including lift, restaurant, room service, airport shuttle, security access and baby cots available for families. With easy access to everything in Brisbane and the surrounding precincts because of its central location the Sedgebrook on Leichhardt offers travellers a range of Spring Hill apartment accommodation just a short distance from the central station, Queen Street mall, Roma Street parklands, Fortitude Valley, china town, Southbank parklands, Brisbane Airport, shopping centre, local cafes, restaurants and the Conrad Treasury Casino. The City Edge Brisbane Hotel provides cheap Brisbane CBD budget hotel accommodation that is ideal for leisure & corporate travellers. City Edge Brisbane Hotel Accommodation is a walk to Treasury Casino, the Queen Street Mall, Southbank Parklands, Roma Street Parklands, Lang Park, Suncorp Stadium, King George Square, Transit Centre, the Beach, the Brisbane Convention Centre, Brisbane Botanic Gardens and the Eagle Street Pier. With easy access to all of the major tourist attractions in the Brisbane region the City Edge Brisbane Hotel is the ideal place for your next budget accommodation. It also features numerous guest services and facilities including lounge bar, guest laundry, lift, restaurant, tour desk and babysitting service. Conveniently situated just a short distance from the City Edge Brisbane Hotel are lots of popular destinations, as well as interesting things to see and do. The Econo Lodge City Star Brisbane provides travellers with refurbished motel accommodation located in Kangaroo Point, close to the Brisbane CBD. Econo Lodge City Star Brisbane offers affordable hotel motel accommodation ideal for corporate business travellers, leisure holiday travellers, school groups, social groups and business groups. If you are looking for value for money hotel accommodation in Brisbane then the Econo Lodge City Star Brisbane is the ideal place for you. This budget hotel features a variety of rooms that are designed for maximum comfort, as well as great amenities like conference centre, direct internet access, faxing facilities, free car parking, guest laundry, room service, outdoor swimming pool, tour desk, baby cots available for families and daily housekeeping. With easy access to everything in Brisbane and the surrounding precincts because of its central location the Econo Lodge City Star Brisbane offers travellers a range of hotel accommodation just a short distance from the Gabba, rock climbing, abseiling, the Story Bridge climb, the Brisbane River, South Bank, Brisbane Convention & Exhibition Centre, Botanic Gardens, Queensland art gallery & the Mater, Princess Alexandra and Mt Olivet hospitals. The Central Hillcrest Apartments provides budget hotel accommodation in South Brisbane, as well as a range of 1, 2 & 3 bedroom self contained apartments with stunning views of the Brisbane River, South Bank Parklands and Brisbane city skyline. With easy access to all of the major tourist attractions in the Brisbane region the Central Hillcrest Apartments is the ideal place for your next budget accommodation. It also features numerous guest services and facilities including lounge bar, direct internet access, faxing facilities, free car parking, guest laundry, lift, restaurant, room service, sauna, secretarial services, spa, outdoor swimming pool, tennis court, tour desk, bbq, baby cots available for families and daily housekeeping. Conveniently situated just a short distance from the Central Hillcrest Apartments are lots of popular destinations, as well as interesting things to see such as children's play areas, parks and gardens, restaurants and cafes, CityCat terminal, cinemas, theatre, opera, ballet & performing arts, the River Stage, Botanic Gardens, shopping, Treasury Casino, Convention Centre and the Gabba cricket ground in the nearby suburb of Woolloongabba. The Annerley Motor Inn is located only 6 kms from the Brisbane CBD and provides affordable accommodation with a selection of motel rooms. Guests staying at this property can explore the Brisbane CBD and all its city attractions and then relax by the pool after a day of sightseeing. Ideally situated in a great location the Annerley Motor Inn and Apartments is within easy reach of all the major attractions that Brisbane has to offer. This along with the many guest facilities like faxing facilities, free car parking, guest laundry, room service, outdoor swimming pool, tour desk, bbq facilities and daily housekeeping is what makes the Annerley Motor Inn and Apartments such a great place for a relaxing stay. Ideally positioned only a short distance from this affordable Annerley accommodation are lots of popular destinations, as well as interesting things to see and do such as Brisbane Convention centre, Suncorp Stadium, South Bank, The Gabba and the Brisbane Entertainment Centre. The Airport Hacienda Motel, Hamilton offers 3.5 star hotel motel accommodation close to the Brisbane Airport.The Airport Hacienda Motel offers comfortable accommodation in Brisbane at an affordable price. The Airport Hacienda Motel is well located in Brisbane Airport, meaning that it is close to everything that the city has to offer. As well as this the property also has numerous guests facilities and services including bar area, direct internet access, free car parking, guest laundry, gymnasium, restaurant, room service, sauna, spa, outdoor swimming pool, tennis court, tour desk, garden, atm/banking, airport shuttle, 24 hour reception, baby cots for hire and daily housekeeping. City Park Apartments offer 3.5 star studios, 1 & 2 bedroom self contained serviced apartments, perfectly located close to the Brisbane CBD.Ideal for business or leisure, the Brisbane City Park Apartments are the perfect central base from which to experience the best Brisbane has to offer. Staying at the City Park Apartments in Brisbane allows you to make the most of the many guest facilities at this affordable property, including the free car parking, lift, outdoor swimming pool, tour desk and security. Chasely Apartments offers 3.5 star 1 & 2 bedroom self contained serviced apartments at the best riverside address in Brisbane.Overlooking the Brisbane River, The Chasely Apartments Hotel is the most affordable home-away-from-home accommodation, ideally located in Brisbane next door to the renowned Wesley Hospital, close to Suncorp Football Stadium, nearby trendy restaurants on Park Road, with Brisbane CDB and Southbank only a short bus or ferry ride away. Staying at the Chasely Apartments in Brisbane allows you to make the most of the many guest facilities at this affordable property, including the business centre, conference centre, direct internet access, faxing facilities, free car parking, lift, tour desk, airport shuttle and baby cots for hire. From this ideal location in the centre of the city, the three and a half star Metro Hotel Tower Mill Brisbane places all the sights and experiences of Brisbane at your fingertips. Each Hotel accommodation room has its own private balcony, and a variety of in-room features such as complimentary movies, foxtel and air conditioning. Staying at the Metro Hotel Tower Mill Brisbane in Brisbane allows you to make the most of the many guest facilities at this affordable property, including the bar area, direct internet access, faxing facilities, guest laundry, lift, restaurant, room service, tour desk, atm/banking, 24 hour reception, baby cots for hire and daily housekeeping. The Brisbane Airport Inn ( formerly the Airport Inn Brisbane), offers clean, comfortable, affordable holiday accommodation to suit all needs and budgets close to Brisbane Airport. Located opposite the Brisbane port harbour of Hamilton, and only a short stroll to the City Cat ferry pontoon and City bus stop from which you can access the Brisbane city center within minutes, the Brisbane Airport Inn Hotel & Apartments is surrounded by a variety of restaurants, cafes and boutique shopping, city council library, 7 eleven, pubs and all major banks. No matter the reson for you travel, business or leisure, the Brisbane Airport Inn provides discount accommodation in a great Brisbane Airport location. It also features a wide range of modern services such as business centre, direct internet access, disabled facilities, faxing facilities, free car parking, guest laundry, tour desk, airport shuttle, baby cots for hire and even daily housekeeping. The Metropolitan Motor Inn offers relaxed executive accommodation in the heart of Brisbane. A warm welcome, enthusiastic service and a spacious quiet guest room makes The Metropolitan Motor Inn a refreshingly different motel, setting standards of excellence in service and value in accommodation for Brisbane's Spring Hill business district. Staying at the Metropolitan Motor Inn in Brisbane allows you to make the most of the many guest facilities at this affordable property, including the bar area, business centre, conference centre, direct internet access, free car parking, guest laundry, lift, restaurant, room service, tour desk, fee pay parking and 24 hour reception. The Snooze Inn3 star budhet hotel is ideally situated for visitors to Brisbane, right in the heart of Brisbane's most happening and cosmopolitan suburb, Fortitude Valley. Just a few minutes walk from the Fortitude Valley train station, the Snooze Inn is just one stop to the Brisbane city centre and walking distance to all of the best bars, clubs, and nightlife of Brisbane. No matter the reson for you travel, business or leisure, the Snooze Inn provides discount accommodation in a great Fortitude Valley location. It also features a wide range of modern services such as direct internet access, faxing facilities, guest laundry, baby cots for hire and daily housekeeping. The Southern Cross Motel & Serviced Apartments Brisbane offers 3.5 star modern hotel motel accommodation as well as brand new 1 & 2 bedroom self contained serviced apartments in the heart of Kangaroo Point, close to the Brisbane CBD. The Southern Cross Motel and Serviced Apartments Brisbane is well located in Kangaroo Point, meaning that it is close to everything that the city has to offer. As well as this the property also has numerous guests facilities and services including bar area, conference centre, direct internet access, disabled facilities, faxing facilities, free car parking, guest laundry, lift, restaurant, outdoor swimming pool, tour desk, BBQ facilities, atm/banking, 24 hour reception and daily housekeeping. The City Palms Motel offers 3.5 star budget hotel accommodation centrally located in Fortitude Valley, ideal for leisure or corporate business travellers alike. FREEE WiFi.Suited to either short or long term accommodation, The City Palms Motel Brisbane is conveniently situated in the heart of Fortitude Valley, only minutes from the great shopping and night-life of the Brisbane CBD, Cosmopolitan Valley, China Town, RNA Show-grounds and the Royal Brisbane Hospital. Staying at the City Palms Motel in Brisbane allows you to make the most of the many guest facilities at this affordable property, including the direct internet access, faxing facilities, free car parking, spa, BBQ facilities, garden, security and daily housekeeping. Centrepoint Apartments offer 3.5 star holiday and corporate accommodation located within the historic, inner city Spring Hill suburb of Brisbane on the fringe of the Brisbane CBD. Centrepoint Apartments offers a selection of one, two & three bedroom fully self-contained, individually furnished apartments. No matter the reson for you travel, business or leisure, the Spring Hill Centrepoint Apartments provides discount accommodation in a great Spring Hill location. It also features a wide range of modern services such as faxing facilities, free car parking, guest laundry, lift, sauna, secretarial services, outdoor swimming pool, BBQ facilities, garden and security. The Rocklea Motel / Hotel Brisbane offers 4 star luxury hotel accommodation in the heart of the Rocklea business district of Brisbane. this absolutely delightful hotel / motel is ideally located close to the Rocklea Market, Archerfield Airport and Speedway, Willowbank and Queensland Raceways, Southbank, the Gabba and the ANZ Stadium. Delicious restaurants are only a short walk away while the Brisbane CBD is a short 10 minute drive. The Rocklea Brisbane is a brand new purpose built hotel / motel that will allow you to save your money. Accommodation is of the highest 4 star standard, including facilities such as direct internet connections in your room, disabled hotel rooms, conference and meeting rooms. The Rocklea Hotel Brisbane is the ideal destination for the business traveller, sports fan or tourist alike. So come and let our friendly staff show you what Brisbane hospitality is all about, and make your stay in Brisbane a memorable one. You can also visit our other Brisbane hotels, the Palms International Hotel Brisbane and the Windsor International Hotel Brisbane. Providing quality self contained accommodation in Taringa this property offers affordable apartment accommodation at competitive budget prices. The Taringa Gardens Apartments is ideally located only a short distance from Brisbane CBD with easy access to public transport. The Taringa Gardens Apartments provides easy access to all of the major business and tourist attractions in Brisbane, which is what makes it the perfect self contained apartment accommodation for your next stay in the city. The property also features numerous guest services and facilites such as business centre, child minding, direct internet access, faxing facilities, free car parking, secretarial services, outdoor swimming pool, tour desk, bbq area, landscaped garden, babysitting service and daily housekeeping. The Taringa Gardens Apartments is close to lots of popular destinations, as well as interesting things to see and do such as the Brisbane Botanic Gardens, Queensland University, Wesley Hospital and shopping & ghold at the nearby suburb of Indooroopilly. The Aabon Holiday Apartments offer budget accommodation at discount prices that is centrally located close to the Brisbane CBD, the entertainment centre at Boondall and major Brisbane hospitals. The Aabon Holiday Apartments provides easy access to all of the major business and tourist attractions in Brisbane, which is what makes it the perfect self contained apartment accommodation for your next stay in the CBD. The property also features numerous guest services and facilites such as direct internet access, faxing facilities, free car parking, guest laundry, outdoor swimming pool, tour desk, bbq facilities, landscape garden, baby cots available for families and daily housekeeping. The Aabon Holiday Apartments is a popular place to stay close to the Brisbane city because of its wide range of hotel facilities, central location and friendly customer service. Travellers who choice to stay in this budget Wooloowin accommodation will find themselves within close proximity of everything that the city has to offer. This Brisbane hotel / motel offers four star luxury accommodation in Brisbane. The Windsor Motel Hotel Brisbane is conveniently located close to the major Brisbane hospitals, the showgrouds, Fortitude Valley, the Brisbane airport and the Brisbane city centre. Accommodation in this delightful Brisbane hotel / motel comprises spacious and luxuriously appointed motel suites, set in a beautiful tropical setting, equipped with all the facilities required to ensure a very pleasant stay. Kitchenette motel suites are also available for those who prefer the convenience of self contained accommodation. The Rocklily Restaurant and Bar, with its tropical atmosphere offers a superb international a la carte dining experience - ideal for both formal conference dining or that very special occasion. The Best Western Airport 85 Motel provides travellers with hotel accommodation in Ascot, which is located just 10 minutes from Brisbane International Airport. By choosing to stay at the Best Western Airport 85 Motel guests will be able to choose from a wide range of budget hotel rooms with discount rates available for longer stays. The central Brisbane location of this property means that it is within easy reach of many of city's major attractions, making it a great place to stay for corporate travellers and holiday makers. With easy access to everything in Brisbane and the surrounding precincts of Hamilton, Fortitude Valley and Newstead the Best Western Airport 85 Motel offers travellers a range of hotel accommodation just a short distance from the cafes, boutiques, restaurants, Hamilton Bowls Club, Lone Pine Koala Sanctuary, Alma Park Zoo and Tropical Palm Gardens, Australian Woolshed and Queensland Art Gallery. Toowong Villas Serviced Apartments provides resort style accommodation in Toowong with these well-appointed villas and studio units surrounded by beautiful tropical gardens. Families or executives can save time travelling to work because this venue is ideally located just four kilometers from the centre of the Brisbane CBD and also close to Auchenflower. The comfortable and well equipped Villas are self-contained, including a complete kitchen, plus laundry with washing machine and dryer. The Studio (bedsitter) units have motel style facilities. All Villa and Studio units have either a balcony or courtyard, and are airconditioned. Baby cots, high chairs and foldaway beds are available. 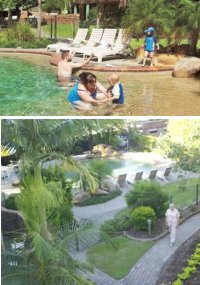 The reception staff can help you to save money on kids activities as well as the Citycat, Ferries, Mt Cootha Botanic Garden & Planetarium, Qld University, Shopping, Koala Sanctuary, Golf Courses, Museum and Art Galleries. 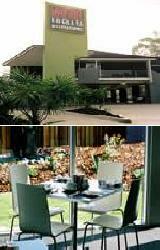 Four-star accommodation in Boondall, Brisbane at amazing discount prices. Palms International Hotel Brisbane offers luxurious motel suites, with excellent facilities amidst a delightful tropical setting. The remarkable Rocklily Restaurant and Bar offers a superb international a la carte dining experience - ideal for both formal conference dining or that very special occasion. With accommodation close to the Brisbane airport, Brisbane Boondall Entertainment Centre, Brisbane Northern Industrial Zones, Eagle Farm, Virginia Strathane, Virginia Golf Club and only 20 mins from the Brisbane CBD, the Palms International is the perfect choice for budget accommodation in Queensland. Travellers will find that the Brisbane Manor Hotel is a true home away from home that prides itself on offering some of the best budget accommodation in Brisbane with a great, friendly array of staff. Ideally situated in a great city location the Brisbane Manor Hotel is within easy reach of all the major attractions that Brisbane has to offer. This along with the many guest facilities like lounge bar, free car parking, guest laundry and tour desk is what makes the Brisbane Manor Hotel such a great place for a relaxing stay. For a long time business and leisure travellers have been staying at the Brisbane Manor Hotel because of its unique home away from home feeling. Also the friendly and knowledgeable staff and excellent array of facilities at these Brisbane CBD apartments will ensure that your stay in the city is completely trouble free.